Ready for unconditional love this Valentines Day? 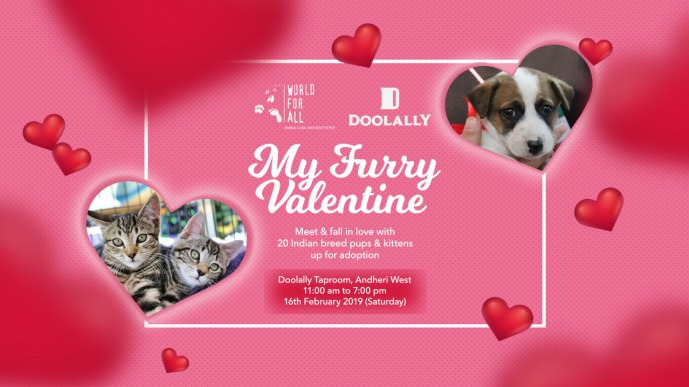 Come to Doolally Taproom, Andheri on 16th February to meet and fall in love with 20 adorable Indie pups and kittens ready for adoption! Healthy and vaccinated, these babies have been rescued from horrific conditions, barely surviving. Come on 16th and you'll have a chance to find the one animal that will love you unconditionally, be the most faithful, loyal and caring one to you and your family! You will have a chance to save a strays life and at the same time they will save yours! *Interested adopters MUST be accompanied by family members. Share "World For All presents My Furry Valentine"